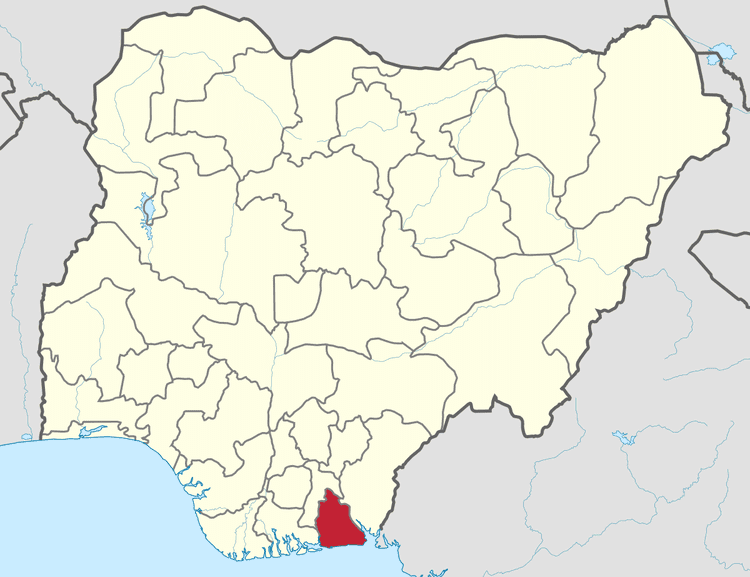 Akwa Ibom is a state in Nigeria. It is located in the coastal southern part of the country, lying between latitudes 4°32′N and 5°33′N, and longitudes 7°25′E and 8°25′E. The state is located in the South-South geopolitical zone, and is bordered on the east by Cross River State, on the west by Rivers State and Abia State, and on the south by the Atlantic Ocean and the southernmost tip of Cross River State. Akwa Ibom is one of Nigeria's 36 states, with a population of over five million people. The state was created in 1987 from the former Cross River State and is currently the highest oil- and gas-producing state in the country. The state's capital is Uyo, with over 500,000 inhabitants. Akwa Ibom has an airport and two major seaports on the Atlantic Ocean with a proposed construction of a world-class seaport Ibaka Seaport at Oron. The state also boasts of a 30,000-seat ultramodern sports complex. Akwa Ibom state is also home to the Ibom E-Library, a world-class information centre. In addition to English, the main spoken languages are Ibibio, Annang, Eket and Oron. 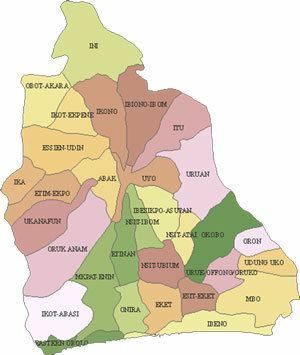 Uyo, Eket, Ikot Ekpene, Etinan, Oron, Abak, Ikot Abasi, and Ibeno. 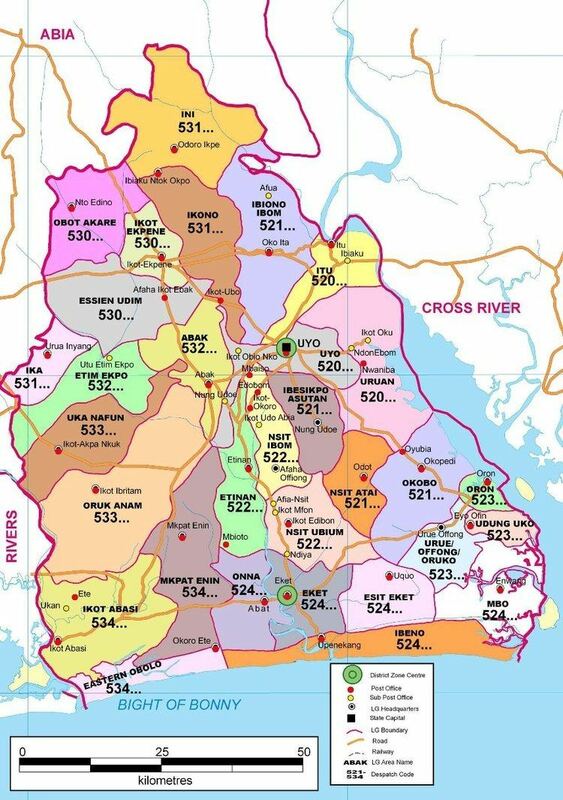 The region of the state was created out of Cross River State on September 23, 1987. The Ibibio language belongs to the Benue–Congo language family, which forms part of the Niger–Congo group of languages. Despite the homogeneity, no central government existed among the people of what is now Akwa Ibom State prior to the British invasion in 1904. Instead, the Annang, Oron, Efik, Ibonos and Ibibio were all autonomous groups. Although several Scottish missionaries arrived in Calabar in 1848, and Ibono in 1887, the British did not firmly establish control of the area until 1904. In that year, the Enyong Division was created encompassing the area of the current state of Akwa Ibom, with headquarters at Ikot Ekpene, an Annang city described by the noted Africanist Kaanan Nair, as the cultural and political capital of Annang and Ibibio. The Akwa Ibom State Ministry of Education is tasked with monitoring the education sector of the state. The current region of Akwa Ibom State in old Calabar Kingdom was the first to encounter Western education in Nigeria with the establishment of Hope Waddell Training Institute, at Calabar in 1895, and the Methodist Boys High School at Oron in 1905 as well as other top schools such as the Holy Family College at Abak and Regina Coeli College in Essene. Late Dominic Cardinal Ekanem (CFR) first cardinal in English-speaking West Africa. First Nigerian Cardinal to qualify as a candidate to the papacy. Vincent Enyeama Professional footballer and former Super Eagle captain. Politics in Akwa Ibom state are dominated by the three main ethnic groups, the Ibibio, Annang and Oron. Of these three, the Ibibio remain the majority and have held sway in the state since its creation. For the past eight years, the Annang people held sway, since the governor for those eight years was from Ikot Ekpene senatorial district.